You’ve probably been eating ponzu all along, even if you didn’t know it. It’s the citrussy soy sauce they put on top of certain dishes at the sushi bar. But it has uses far beyond that in your kitchen. There are many products where I’m happy to find a value proposition — inexpensive flour tortillas, for example, are often much better than their pricier counterparts. But sometimes you do get what you pay for. While you can purchase a reasonably good inexpensive ponzu by makers such as Kikkoman and Mitsukan, often in your grocery store, I find that paying a bit more gets you a much better bottle — one made, for example, with real yuzu juice rather than citric acid. (Yuzu is a Japanese citrus that can be difficult to find in the U.S.) My favorite is called Umajimura (I think), pictured above. (I’ve seen this advertised as “Japan’s Favorite Ponzu,” so I guess I’m in good company.) It’s about $12-$14 a bottle. But a little goes a long way, and it lasts a long time in your fridge. If you’ve got a Japanese store near you, go purchase a few different bottles and experiment. 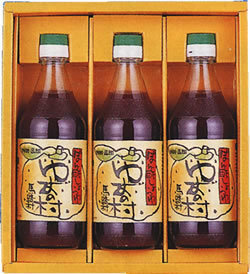 You can also find a wide variety available online — just Google: ponzu. Prepare the Swiss chard. Heat a tablespoon of olive oil in a pan over medium heat. Add the Swiss chard and stir, wilting. Turn heat off. In another pan, heat another tablespoon of olive oil over medium high heat until it begins to smoke. Add halibut, sear on one side (about 2 minutes), turn over and cook another 2 minutes. Remove from heat to a plate, and let rest in a 200-degree oven for 5 minutes. While the fish is resting, turn Swiss chard back on over low heat, and make the sauce. Place ponzu and lemon juice in a small saucepan over high heat. When it begins to boil, remove from heat. Stir in cold butter, stirring constantly, until it is incorporated and the sauce is silky. To plate, place a small mound of Swiss chard in the center of two plates. Place a fillet of halibut on top of the chard. Spoon some sauce in a circle around the chard, and drizzle a little over the top of the fish. Serve. There is no better purpose for Ponzu than for accenting several slabs of Blue Fin toro. I find ponzu a little too much for blue fin. I like blue fin simple — some nice soy sauce, and little freshly grated wasabi.